Original piano melodies in the easy-listening/healing genres. 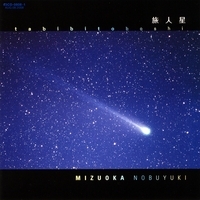 Composer-pianist Nobuyuki Mizuoka has written over 300 songs and released six indie albums in Japan to date. He is well known for his sophisticated, cross-genre songwriting and powerful musicianship that produce unforgettable works of jazz, contemporary pop, new age, easy listening and more. His distinctive music is regularly featured in TV Asahi's documentary series "Hidden Hot Springs Romance (秘湯ロマン)," and it also has been published in the DVD release of Kansai Telecasting Corporation's "Gout Temps Nouveau (グータンヌーボ)" program. The original songs of "Tabibitoboshi: Wanderer's Star" simply and beautifully describe a nostalgic journey of life. The album's fourth track "シリウス (Sirius)" is a poignant ballad of love and loss with original lyrics by Nobuyuki Mizuoka and vocals by Camaru; it is featured in studio- and live-version videos on YouTube.